How Do We Make Sense Of The Senselessness? Yesterday in Oregon, an all-to-familiar scene played out. A school shooting. A gunman, regardless of age, shattering the safe haven of a school. This occurrence has become too common. In case you were wondering, it's the seventy-fourth school shooting since the tragedy in Newtown, CT, on December 14, 2012. Think about that, let it sink in. In the eighteen months since that horrific day, we have averaged four school shootings per month. Where is the outrage? Where are the amended laws? I am an educator. I teach Sixth grade English. After Newtown, my school took drastic school security measures. We have multiple cameras and we have security badges with electronic codes to wave at automatic locks. All school doors are constantly locked. Every visitor must sign in at the office after getting buzzed through the doors, and they must wear large sticker-badges with VISITOR stamped in bold lettering. What we have gained in security, we have lost in our innocence. A school community is supposed to be a family. Families shouldn't be wary of each other. Families shouldn't have to remain vigilant. Nevertheless, it is the situation in which we now find ourselves. Growing up, the biggest threat of school violence was a school fight. These were dealt with quickly and effectively by those in charge, and the days and weeks went by with no further problems. The cycle would repeat itself, and the days and years would blur past, like the scenery outside of a train's window. 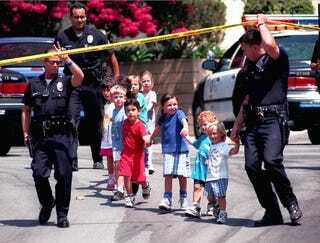 Unfortunately, the events that unfolded on April 20, 1999 would change how we viewed school violence. Eric Harris and Dylan Klebold murdered 12 classmates and one teacher in cold blood. The town of Columbine went from a picturesque image of Americana to the face of "what's wrong with our kids" in the blink of an eye. This tragedy shook the nation. As an educator I was stunned. The American people were outraged, shocked, dismayed, confused, and devastated. It seems, unfortunately, that these feelings didn't change anything. Deming, NM (1999); Mount Morris Township, MI (2000); Lake Worth, FL (2000); Santee, CA (2001); Cold Spring, MN (2003); Red Lake Reservation, MN (2005); Jacksboro, TN (2005); Hillsborough, NC (2006); Bailey, CO (2006); Cazenovia, WI (2006); Nickel Mines, PA (2006); Blacksburg, VA (2007); DeKalb, IL (2008); Conway, AR (2008); Chardon, OH (2012); Newtown, CT (2012); Santa Monica, CA (2013); Sparks, NV (2013); Littleton, CO (again - 2013); Seattle, WA (2014); Troutdale, OR (2014). These are only some of the tragedies that have occurred since Columbine in 1999. Money spent on wars in Afghanistan and Iraq, along with any "war on terror" target: $1,500,000,000,000 and growing daily. Look at that figure. Let it sink in for a minute. Over 1.5 TRILLION dollars. How much money has been cut from mental health funding since 1999? How much money has been cut from education since 1999? How can anyone see schools in the same innocent light anymore? It's tragic that when I look at my classes full of students, beautiful and eager learners with whom I am entrusted every day, and I run through my Crisis Plan Strategy. I would put myself in harm's way to protect any of my students at any time. I come from a family of educators, none of whom had to play out this scenario daily. I don't know how to make sense of this senselessness. I don't have any answers. What I do know is this - not enough has been done to help people who need help. Not enough has been done to keep our students safe. Not enough has been done to shine a light on all forms of mental illness, and to give those afflicted the proper care they need and deserve. I am a teacher. I love what I do. I wish I could do more.